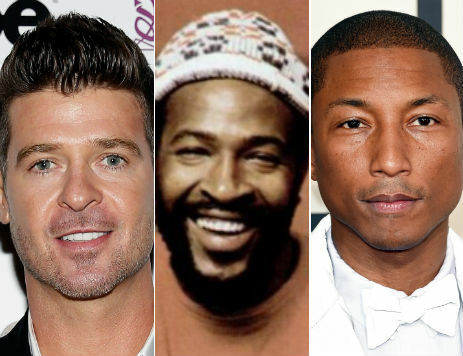 Pharrel Williams, Robin Thicke and rapper TI – real name, Clifford Joseph Harris, Jr. – were taken to court on Friday 6th March over the copyright infringement by Marvin Gaye’s family for the resemblances of the Marvin Gaye song ‘Got To Give It Up’. It was revealed that Pharrel Williams and Robin Thicke made over £3 million each as well as TI making over £700,000, from an overall profit of just over £10 million, with the rest of the money going to the record companies (Interscope, UMG Distribution and Star Trak). (Hollywood Reporter ). Of course, the artist’s say that they didn’t steal the song with Thicke even stating, “The record would have happened with or without me. None of it was my idea … I was drunk … [and] I’d say 75% of it was already done when I walked in.” (Hollywood Reporter ). However, it was today revealed that the Gaye family had won the ‘Blurred Lines’ case. The Gaye family are to be given money from record and live sales as well as damages caused from the copying of the ‘Got To Give It Up’ song written by Marin Gaye. What this case shows is the blurred line between copying a song and getting inspiration form a song. As artists are aware, it can be sometimes difficult to create a song from scratch. Sometimes you need some influence from music, this can be from listening to your favourite bands or going out and listening to different genres you have never heard. 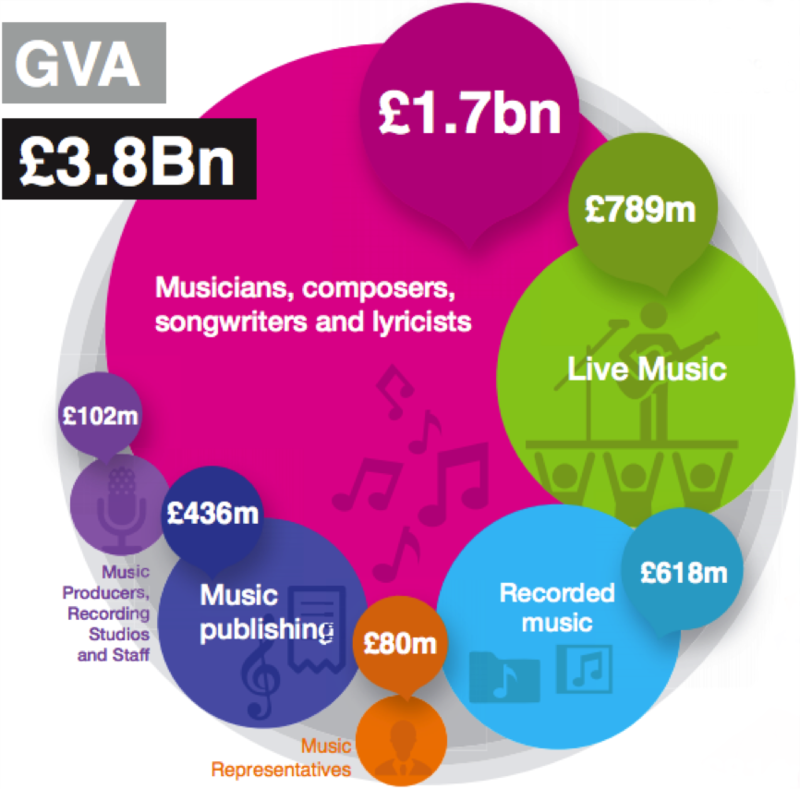 Sometimes a guitar riff or drumbeat can come to mind, when you are doing something irrelevant to music altogether. The song ‘Yesterday’ by the Beatles was thought up by Sir Paul McCartney from a dream he’s had one morning. Sir Paul McCartney was interviewed on XFM and told the radio station that “It came to me in a dream…I just woke up one morning and it was in my head.” (Gigwise ). Another example of a court case was from Coldplay’s song ‘Viva La Vida’ which had allegedly copied “substantial original portions” from the song ‘If I Could Fly’ by Joe Satriani. Unlike the ‘Blurred lines’ case, Coldplay swore that they had never heard the song ‘If I Could Fly’. The court dismissed the case, with both parties having to reach an out of court financial settlement on their own terms. These examples of Sir Paul McCartney and Coldplay show that there doesn’t have to be a direct influence from music that’s already been made. Nevertheless, it could still be argued that although Coldplay hadn’t even heard the song ‘If I could Fly’ and that Sir Paul McCartney had one morning dreamt about the song ‘Yesterday’, they both had influences from music but they hadn’t realised. A dream is made up of situations that happen in the day or what you’ve been thinking of recently. It is plausible to think that Sir Paul McCartney had heard music that day but didn’t consciously think about it, with the brain creating a song over night, that in a conscious state (the next morning) he’d put together to make sense. This could be the case with Coldplay as even though the band stated they hadn’t heard the song ‘If I could Fly’, they may have heard it unconsciously and thought they had created a new song but instead were influenced by a song similar to ‘If I Could Fly’. Although not completely similar, these two scenarios had different outcomes with one being taken to court and the other not. What this goes to show is that especially nowadays it’s a lot easier to be alleged of copyright infringement even when you think you created the song from scratch or with the ‘Blurred Lines’ case with an influence from music from the past. This case with ‘Blurred Lines’ was really made for money purposes and not artistic theft. The reason it was made public was to boost sales. This was the second event that I was, in part, doing the sound engineering for. With this event, there were ten people from my course who were doing the sound engineering, as well as setting up of equipment and organising what was going on behind stage. 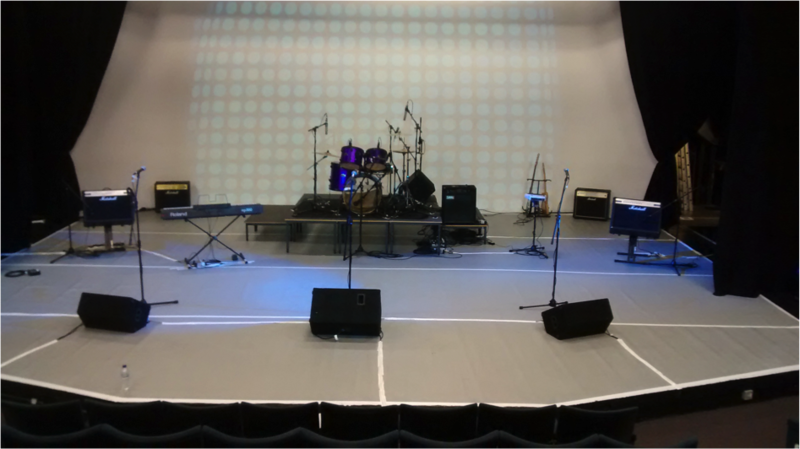 For this event, my colleagues and I had to set up a gig for performing musicians from Leicester College at Upper Brown Street in Leicester. There were going to be a total of ten bands playing in the space of two and a half hours, so each of my colleagues including I were assigned a band to do the live sound engineering for. The stage had been set up the day before for all the different instruments and musicians. 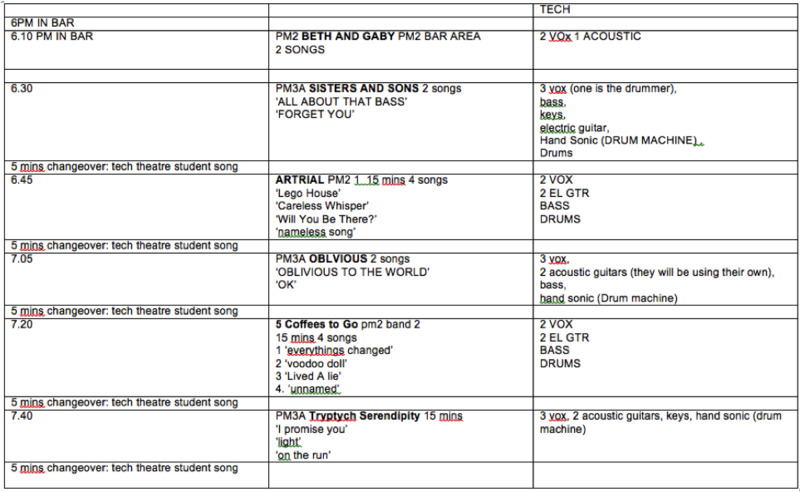 This included a drum kit, electric guitars, bass guitars, a drum machine, a keyboard and a violin as well as vocals. The miking of the drums was set up the same way that we had practiced in the weeks before (See the blog: ‘Setting up the Drum Kit at Upper Brown Street’). 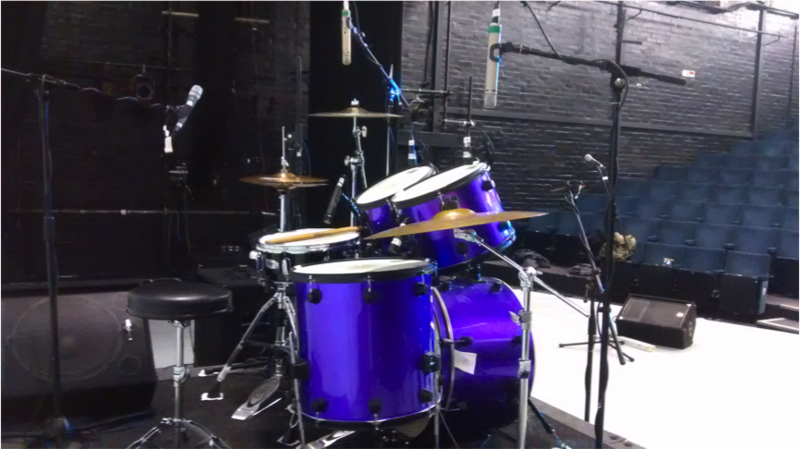 The drum kit was placed on top of small stage at the back of the main stage in the centre. This was done to so that cables could be placed underneath to prevent any tripping over of cables on stage as well as neatness. 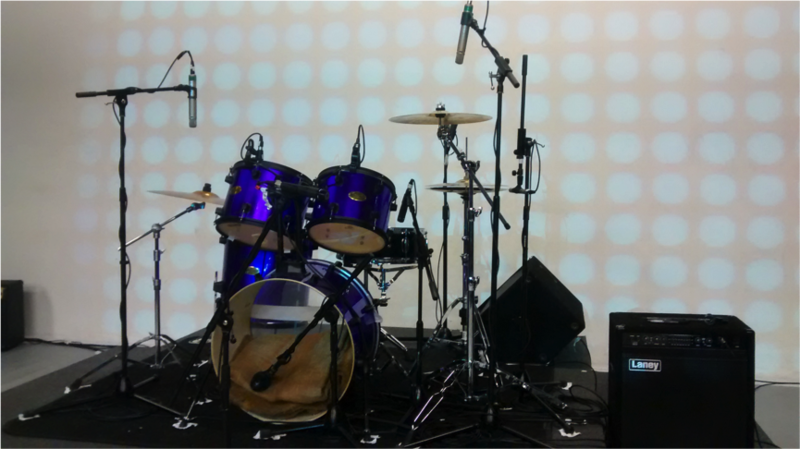 (see channel list for what drum microphones were used). There were two guitar amps set up on either side of the stage. They were placed on stands as to direct the sound of the amplifiers to the audience as a whole (not just to the front row of the audience, if the amplifier was placed directly on the floor). 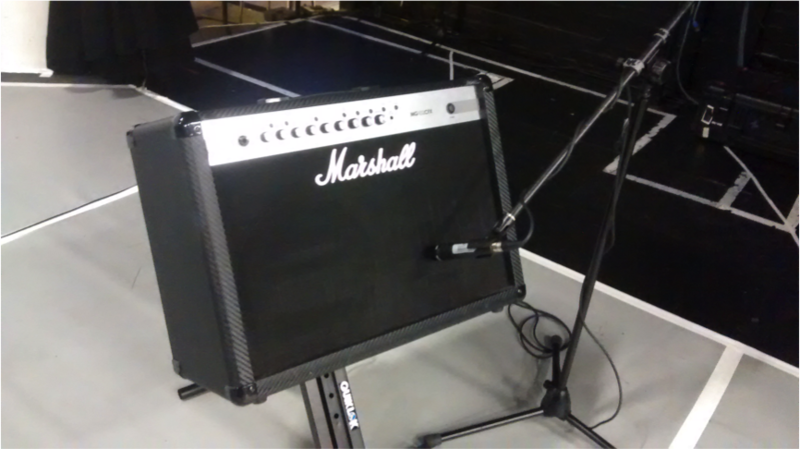 The microphones used for the guitar amplifiers were Shure SM57’s. This is because Shure SM57’s are industry standard and are very versatile and sturdy, which is also why it was used for miking up the snare drum and toms for the drum kit. The Shure SM57’s were placed facing the speaker of the amp, with it aiming near the point between the cone and the speaker paper to give an even sound of the soft lower frequencies (from the paper) and the sharp higher frequencies (from the cone). The bass guitar amplifier was placed on the front left of the drum kit stage. The reason for this was to also prevent tripping hazards as well as tidiness on stage. The bass amp is different to guitar amps because the frequencies that are produced are low, which means they travel in every direction rather than primarily the way the speaker is facing, which is what happens with guitar amplifiers. It was with this reason that the bass amp was placed on the side of the drum stage, as to take up less room on the main stage. The bass guitar was plugged into a D.I. box before being plugged into the amplifier, which meant the bass amplifier didn’t need to be miked up. There was three vocal microphone placed at the front on the left, the centre and the right of the stage. Although the microphones were placed more forward than to other instruments and microphones, the vocal microphones weren’t placed to the edge of the front of the stage. This was because they needed to be behind the front of house speakers as to reduce feedback. The microphones used for the vocals were Shure SM58’s. Just as the Shure SM57 is industry standard, the Shure SM58 is even more so, and is considered the most popular used microphone in the world. The SM58’s have a bass roll off and brightened mid range to cut through the live sound mix. The microphone’s also have a cardioid polar pattern, which mean that it isolates the main sound source, minimising background noise and reducing the possibility of feedback. 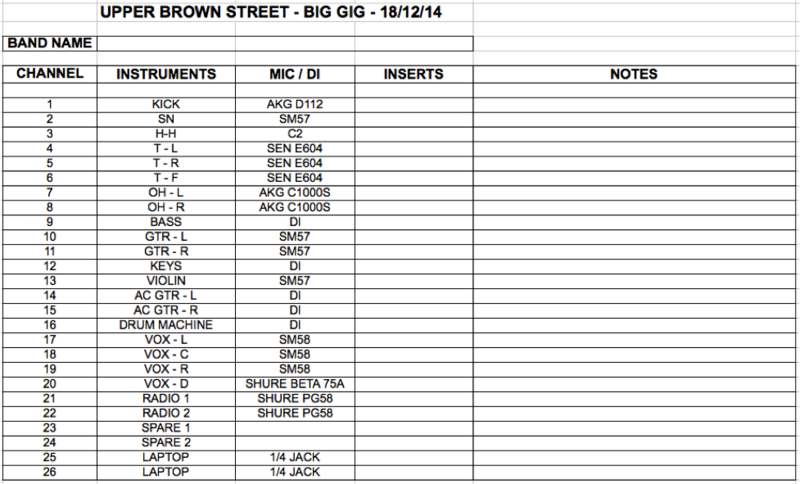 As it states on the mic list, the rest of the instruments; keyboard, acoustic guitars and drum machine, were all D.I.’d. This meant there were no speakers needed as the instruments went to a Direct Inject box and then to the snake box. The exception was the violin which wasn’t DI’d as the instrument didn’t have a DI built into it, so instead an SM57 was used (which was placed in front of the drum kit until it was needed for the violinist). The monitors used were JBL monitors. The monitors were placed in front of each microphone stand so that each singer/musician could hear themselves or each other. Another reason for placing them there was so that each musician could have their own monitor to listen from, which creates more space on stage rather than just having a centre monitor and the whole band in the middle of the stage. As well as the front monitors there was also a drum monitor for the drummer, positioned to the left of the drummer so he/she could listen to specific instruments or vocals because the drums would be to loud to hear the monitors that were at the front of the stage. The front of house speakers were made up of a three-way speaker system (low, mid and high loud speakers) on the left and right of the stage. 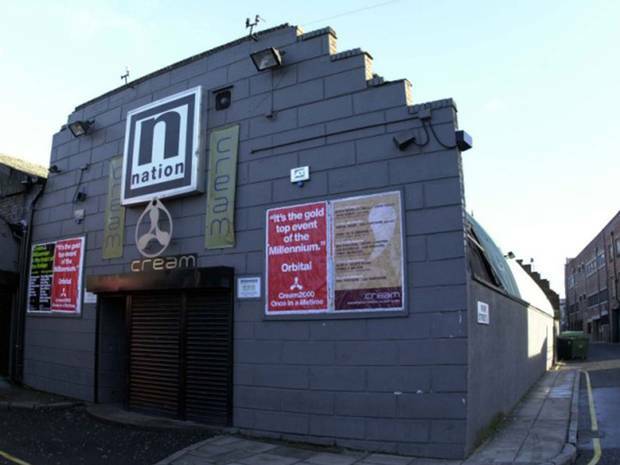 The loudspeaker system was adequate for the venue but not as good as, they should have been. As the venue is a theatre, half of the time the sound used is for acting and sound effects for theatre plays. For that use the loudspeaker system is passable, but for a live gig it wasn’t sufficient, which was partly to do with the types of speakers used and partly because of the positioning of them. 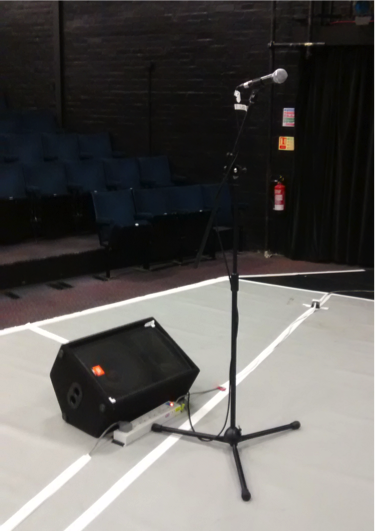 The front of house speakers were placed on the stacked on the floor on each side of the stage and facing slightly central to the audience. The tallest speaker (the smallest high end speakers) was directed at around the middle row of the audience, which meant the mid and high frequencies were directed to only half the audience. This created a sound that sounded better at the front of the theatre compared to the back of the theatre, which didn’t get as much detail and clarity from the mix. 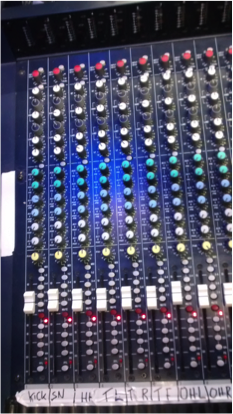 This intern created a mix, which was louder in the highs and mids than the low’s because from the position of the mixing desk (at the back of the theatre) these frequencies were attenuated due to the positioning of the front of house speakers. What could have been done was use the headphones for monitoring the sound that was coming from the speakers, but at the time it sounded good. In the recording from the sound recorder, the bass guitar was very low in the mix but compared to the sound from the video recording the bass wasn’t too quiet and was fairly audible (which admittedly wasn’t the best quality sound wise, but still did a good enough job for you to hear the bass guitar). At 2:15 I turn down the guitar to make the vocals stand out as the guitar was to loud in the mix and was dominating the rest of the band. At 4:35 I turn up the bass guitar, as that part of the song only has the bass guitar and drums playing behind the vocal, so the bass guitar needs to be made evident in the mix. At 7:35 I turn up the left overhead, to make the cymbals more present in the mix to make ending louder as it’s the final part if the song. At 9:00 I turn down the guitar as it is overpowering the vocals at the start of the song. Upon Evaluation of the live engineering of the band, there are obvious factors that can be improved on for next time I do the engineering for a band. 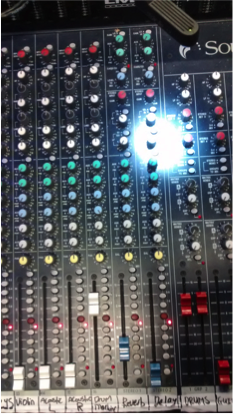 The main point that I noticed was that was using the gain knobs as faders. This is something that I was doing correctly at the beginning of each song, in terms of setting the gain as close to unity gain without it peaking. However using the gain is something that is done when doing a sound check to make sure there’s a good line level, but not something that should be done in the middle of a song. 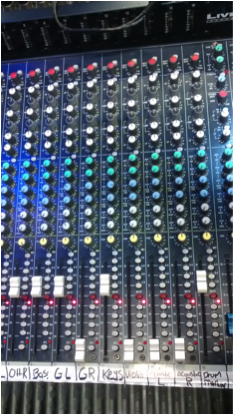 The line level is usually close to unity gain, so the gain is not the problem but instead the volume of sound coming out the speakers, which is controlled from the fader. From watching the video you can see that use the gain knob when I should use the fader, which is apparent with the vocals a lot of the time. The gain knob is also more sensitive than the fader so turning the vocals up or down is heard very obviously rather than a slight difference in the mix from using the fader. Another criticism that can be made was not using the monitoring headphones to hear what the sound was like from the mixing desk and making differences based on that. The differences might be little, but it would make be able to hear parts that weren’t audible because of the room acoustics or crowd absorbing certain frequencies, which attenuate certain sounds. On a whole, there wasn’t the need to change settings for the effects, such as the gates, equalisers or compressors. 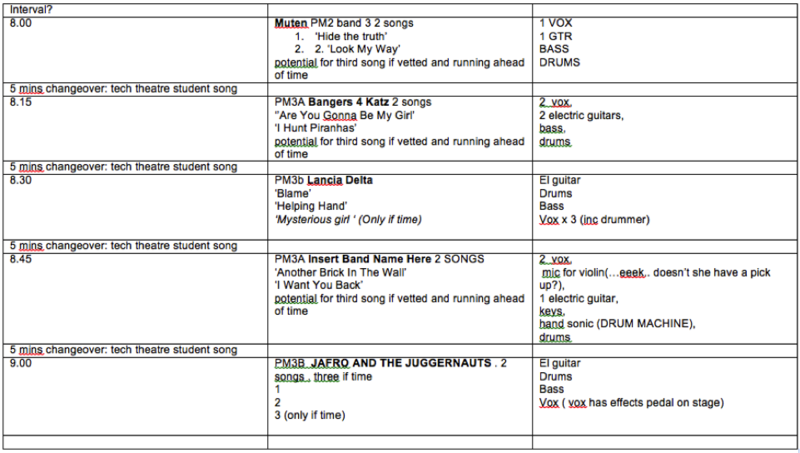 This was in part due to the band being last so the effects were all set to parameters that suited the instruments. It helped that the band was the most experienced and best sounding of the night, not just in terms of sound but the way they played their instruments. An example of this was the singer using the vocal microphone close to his mouth to get the most out of the sound and correctly held it from the grip too. Other examples were that the guitars were tuned before the band went on as well as the drummer playing the drums hard and in the centre of the drums, where the microphones were aiming at, as to get a full sound from the kit.